The PlayStation Portable, or PSP for short, is a handheld games console made by Sony under the PlayStation brand. It was launched in Japan on December 12, 2004, and debuted in North America on March 24, 2005. The computing power of the PSP is comparable to that between the PlayStation 1 and PlayStation 2, being capable of rendering significantly complex 3D graphics to a less detailed extent than the PS2. The console is also capable of supporting network play. The PSP is the native platform for two Grand Theft Auto games, Grand Theft Auto: Liberty City Stories and Grand Theft Auto: Vice City Stories, which both recycled settings in two PS2-native games but are able to retain many features of its more higher-spec counterparts at the expense of lower texture quality and resolution. In addition, the PSP version of GTA Liberty City Stories manages to take advantage of the PSP's network support to include multiplayer modes, a feature which is absent in the PS2 port. Both GTA Liberty City Stories and GTA Vice City Stories have been huge successes in terms of the number of sales in comparison to other PSP games. Grand Theft Auto: Chinatown Wars has also been ported to the system in late-2009. The PSP version of the game had extra missions and more enhanced graphics than the Nintendo DS, iPod Touch and iPhone versions of the same game. There are, as of 2011, three generations of the PSP. 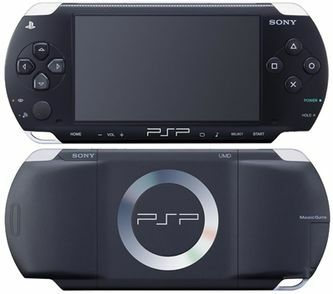 A spin-off, the PSP Go, has been created and released by Sony (although it is now unavailable outside of North America). The PSP has now been superseded by the PlayStation Vita, released in 2011/2012. The logo of the PlayStation Portable. This page was last modified on 7 September 2012, at 16:45.